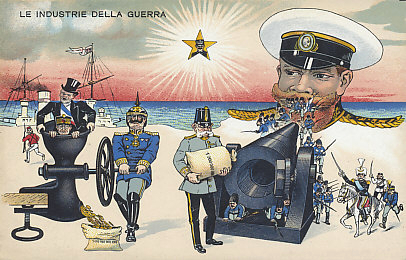 An Italian postcard of the Industry of War. Kaiser Wilhelm of Germany squeezes gold from France and Belgium, filling sacks of money he provides to his ally Emperor Franz Josef of Austria-Hungary who feeds his guns to fire at Tsar Nicholas of Russia who vomits up troops. On the bottom right, Serbia, Montenegro, and Japan join the battle against Germany and Austria-Hungary. To the left, Great Britain flees to its ships. King Victor Emmanuel III of Italy surveys it all, serenely neutral until May 1915. Germany taxed Belgium and occupied France heavily during its occupation, in money, in food and other necessities, and in human life and labor. Austria-Hungary borrowed heavily from Germany to support its war effort. 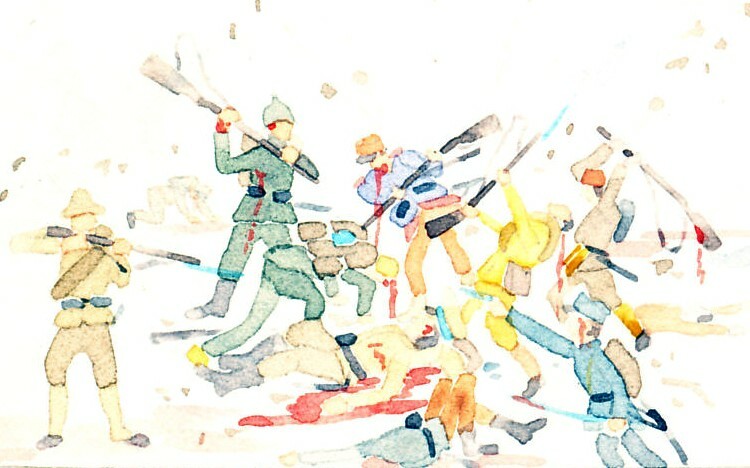 The enormous manpower of Russia was a source of consolation for its allies, and of trepidation to its enemies. Some suspected Great Britain would take its small army and return to its ships, home, and empire. The War Diaries of Albert I King of the Belgians Published from the Original Manuscript and in their Entirety. Edited by General R Van Overstraeten D.S.O formerly A.D.C. to the King. Translated by Mervyn Savill. Albert, King of the Belgians and Commander of the Belgian Army, was an infrequent recorder of the war's events. His War Diaries begin with the campaign of 1915, after the August 4, 1914 German invasion of Belgium, the falls of the Belgian fortresses at Liège, Namur, and Dinant, the siege of Antwerp, and the inundation that ended the Battle of the Yser and left the Belgians holding a small corner of their otherwise conquered country. Albert's editor, Van Overstraeten, places the King's entries within 'a general succinct framework' based on notes of Lieutenant-General Gillain, Chief of the General Staff in 1918, 'a bundle of letters from Comte de Broqueville,' and his own memories. Charles de Broqueville was Belgium's Prime Minister from June 17, 1911 to June 1, 1918, Minister of War from 1912 to 1917, and Minister of Foreign Affairs in 1917. Throughout the war the King struggled to ensure the independence of his army, and that post-war Belgium would be independent and neutral. He was rightly skeptical of the aims of France and Britain in the war, and tried to ensure an Entente Ally drive to victory would be fought in France rather than Belgium. In the course of the war he met with Allied commanders and generals including Joffre, Foch, Nivelle, Pétain, and Haig, with political leaders including Lloyd George, and traveled the French and Italian Fronts.